Review: As you may have already noticed I am a huge fan of Alyson Noel's novels. I fell in love with 'The Immortals' series and I adored Ever's sarcastic, cute and incredibly stubborn kid sister, Riley. So, it won't surprise you how excited I was to hear that there would be a Riley Bloom series. 'Shimmer' takes Riley on a new emotional rollercoaster. She needs to use her initiative and the skills that she acquired in 'Radiance'. Bodhi and Riley's clashing relationship continues in this instalment. You can't help but smile, Riley is a loveable soul as is Bodhi. I've loved the relationship between Bodhi and Riley. They both just need to admit they need the other around. Riley is so strong willed and stubborn, Bodhi does not know what to do with his rebellious apprentice. 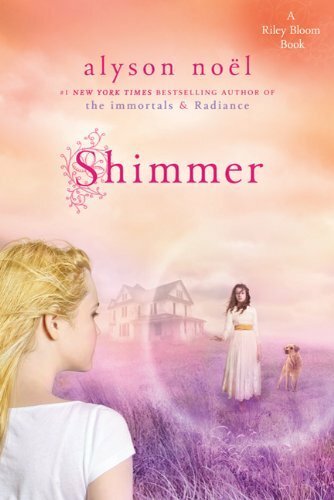 The pace in 'Shimmer' is slightly different to that of 'Radiance' as there are a few sinister moments when you are second guessing the characters and where the story will go. Rebecca is a strange and troubled ghost and she leads the sinister turn of the novel. Prince Kanta is a strange one and I was wary of him. But I shall leave you to your own assumptions. Riley has grown so much as a character and as a Soul Catcher. I cannot wait to see where the rest of the series will go. Each page of 'Shimmer' has you eagerly awaiting the next page, the plot was fantastic and exciting. What I love about the Riley Bloom series is that at the end of each book, you always get a Q&A with the author Alyson Noel. Plus a fantastic snippet of the next book which I must admit always makes me want it there and then. Yep, I cannot wait for the next instalment in 'Dreamland'. YAY! I can't wait for the next book too! I love the series!